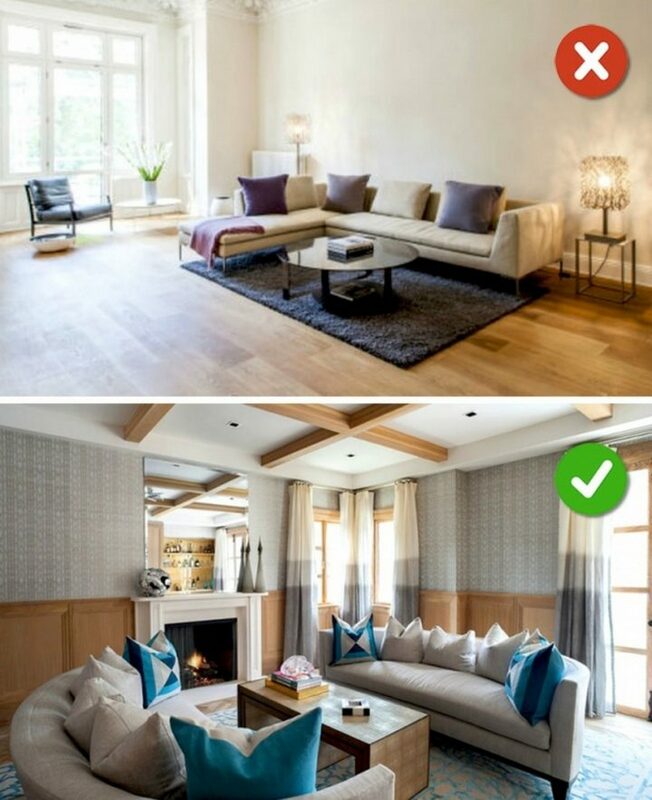 There are many decorating tips for every room in your home but decorating your living room takes extra care. Considering that most of your guests will spend time in your living room and it’s arguably the focal point of your home, it’s important to get it right. 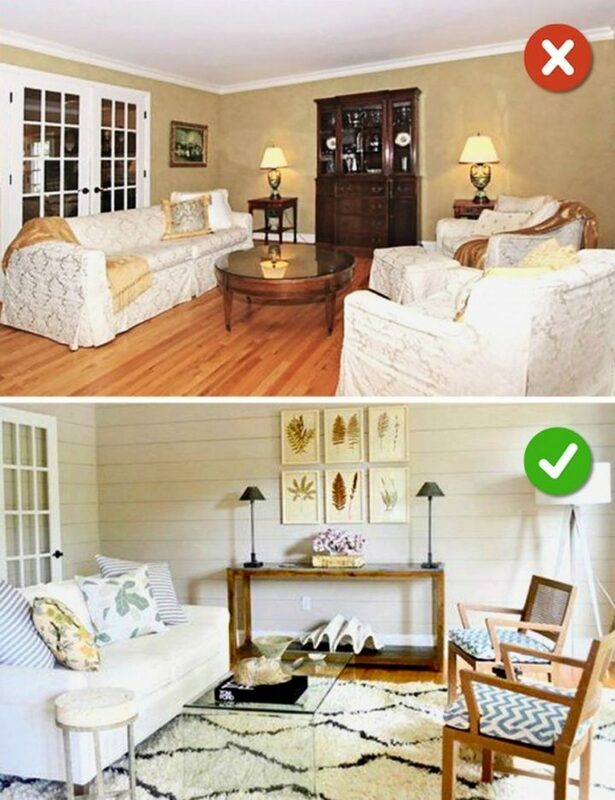 Here are 15 common mistakes in living room design with suggestions on how to fix them. Hanging your curtain about 6-8 inches above the window frame will make your ceiling look higher and will make your living room appear larger. 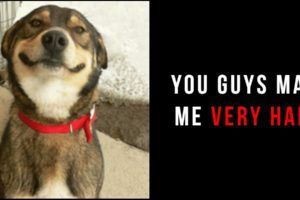 Also, don’t worry about the fabric color matching your furniture. Choose bright solid colors if you have patterned furniture or neutral patterned curtains if most of your furniture has solid shades. 2) Furniture does go out of style. Just like clothing, sofas and chairs do get outdated with time. Bulky sofas with large armrests may have looked good a decade ago but today’s style demands clean lines and sharp silhouettes. While there are exceptions like chesterfield sofas that are classics, choosing traditional styles over edgy, modern designs generally ensures a sofa that looks stylish for years to come. 3) Choosing only one style. Choosing only one style of furniture such as traditional or contemporary makes your room look boring and unoriginal. 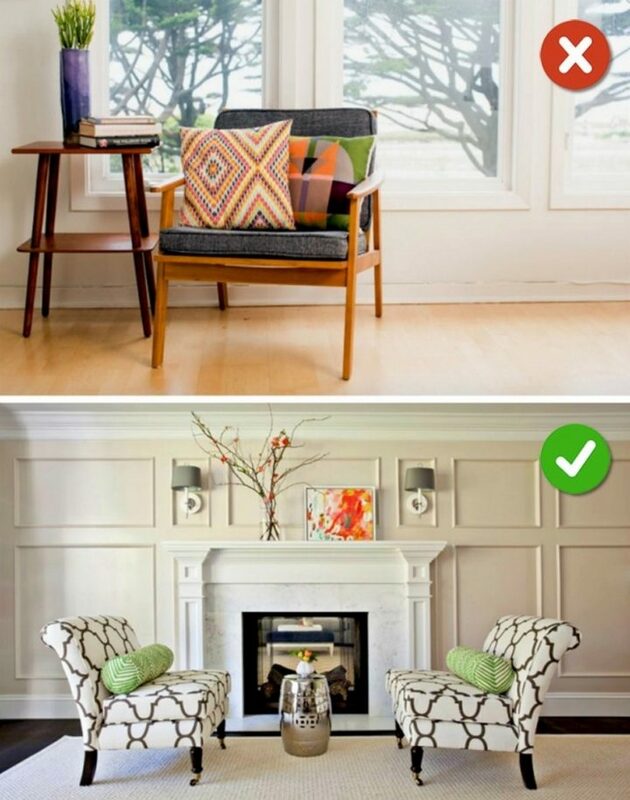 Instead, don’t be afraid of mixing things up with your living room design and mixing your favorite style with other styles such as retro, eclectic, vintage, and many others. 4) Using dated furniture covers. These ain’t your grandmother’s sofa covers! Using a stylish chair or sofa cover can extend the life of furniture and give it an instant splash of color or style. 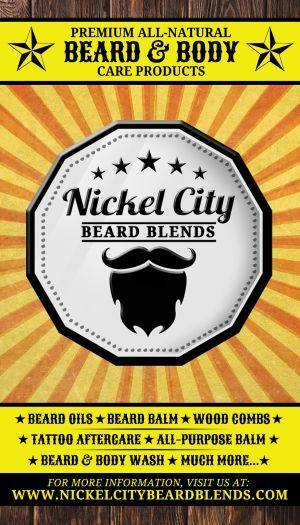 There are many styles available that can either be form fitting or have a relaxed fit. 5) When it comes to potted plants, less is more. Instead of having several small potted plants, decorate your living room with only one or two large potted plants instead. 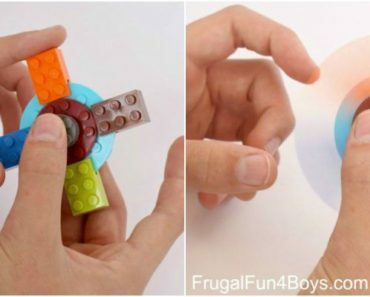 It will make your room appear larger and cozier at the same time. 6) The living room has no focal point. Every living room design needs a focal point. While a fireplace is a common focal point, not every living needs one to remain cozy and inviting. A window with a view, a symmetrical arrangement of framed pictures, or even a colorful one-of-a-kind mural or art piece can bring character and charm to your living room. 7) Not using a room’s functionality to its full potential. Adding a bedroom. The perfect spot would be close to a window and ideally at the opposite end of the entrance. Adding a dining room. Getting a living room and dining room to work together in one room isn’t as difficult as it sounds. Each unit occupying the room would be ideal but even allowing 1/3 of the room to be used as a dining room adds functionality without sacrificing living room space. Adding a home office. Enjoy having the convenience of having a home office in your living room by making a corner available for a desk and chair. 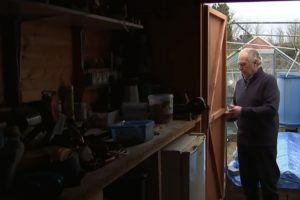 Adding a kitchen. Nothing pushes the open concept more than a kitchen in the living room. 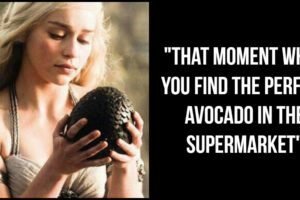 The kitchen should have plenty of sunlight and therefore should be closest to a window. 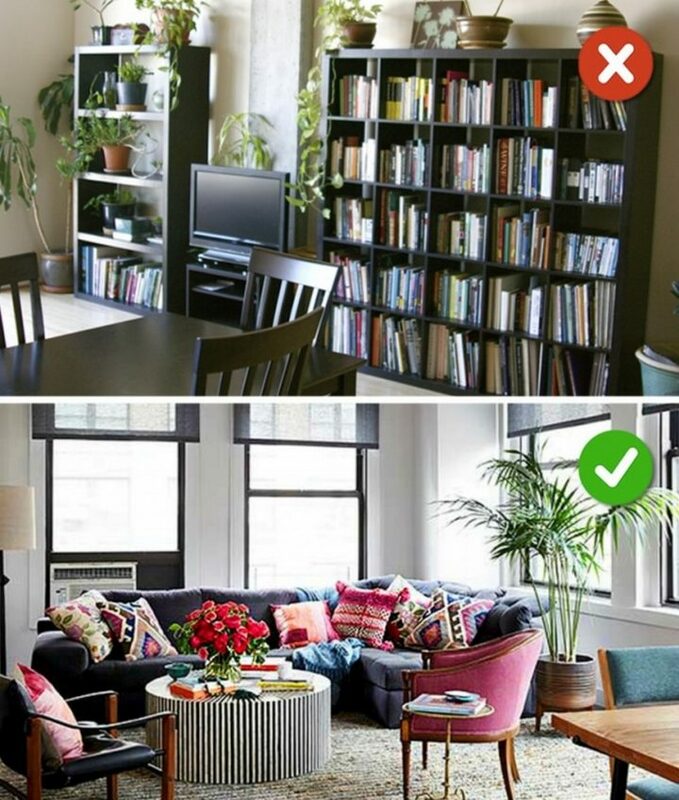 If you’re cramped for space, adding large, overstuffed sofas and chairs can make your room look even smaller. 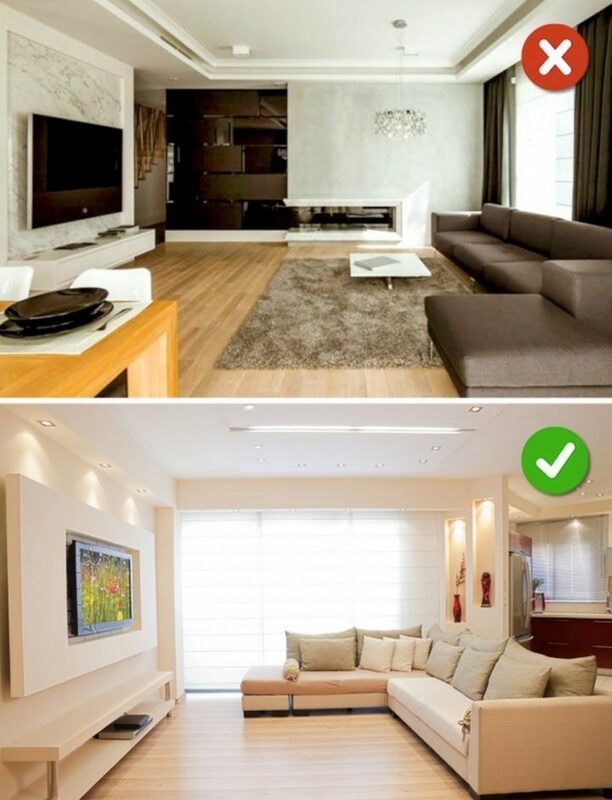 Instead, opt for contemporary furniture with clean lines and separate sofa and chairs instead of a sectional sofa. The perfect height for most photos is 5 feet from the floor to the center of the image. 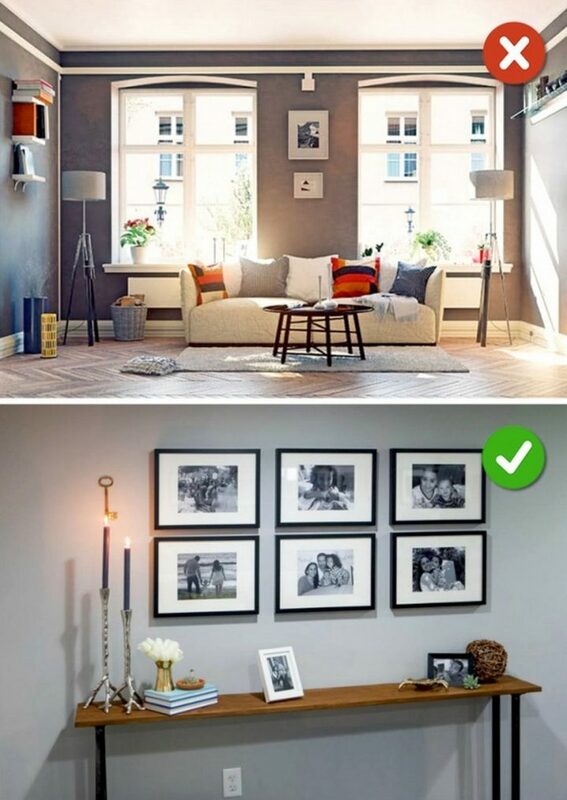 If you have many smaller photos, arranging them as a photo gallery will make your room look cozy and inviting. 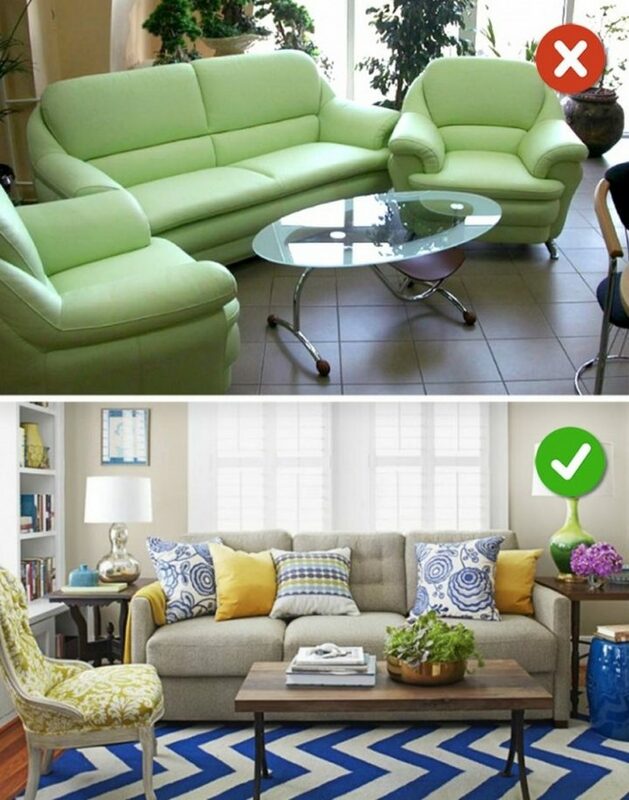 10) Choose furniture that fits your room’s style. While a piece of furniture might appeal to you in a furniture showroom, it may look out of place once you place it in your living room. When shopping for furniture, keep your living room in mind and visualize how it will look with your living room decor. 11) Low ceilings with dark furniture. 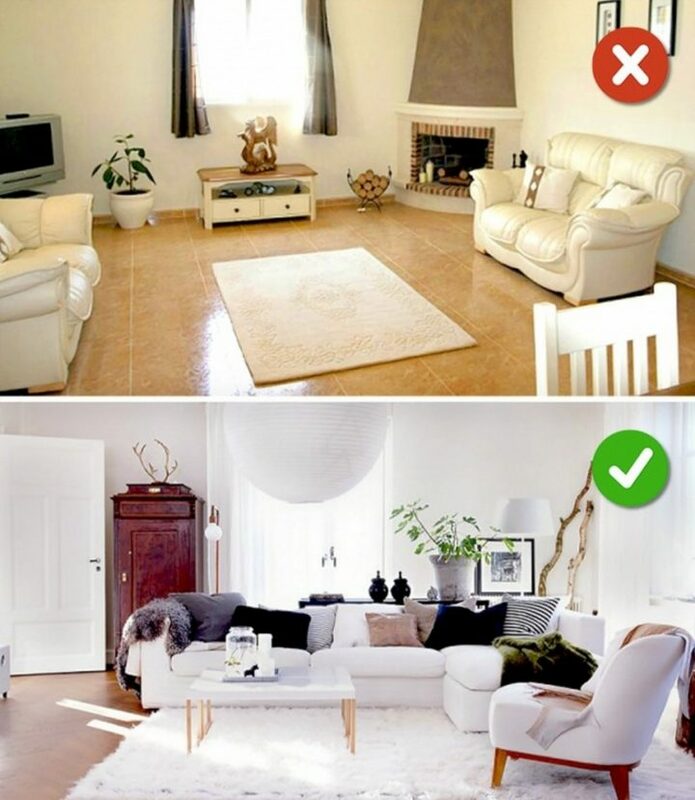 We all know that whiter shades make a room appear larger than darker shades. If you have low ceilings, go for lighter neutral shades for your walls and furniture to brighten your room. 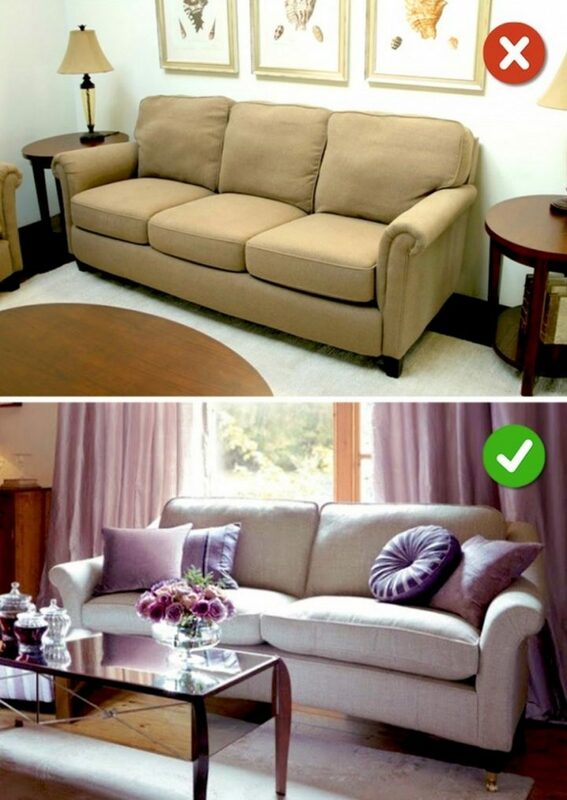 As suggested in #8, also choose compact furniture with clean lines instead of bulky, overstuffed furniture. 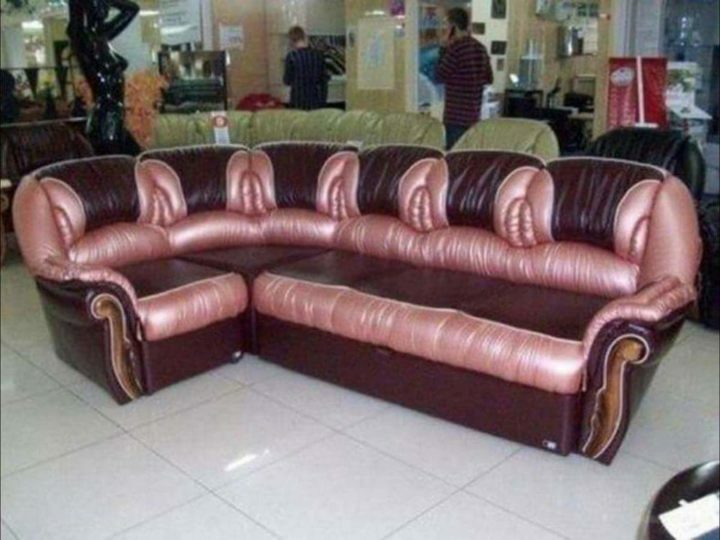 12) Your sofa is against the wall. 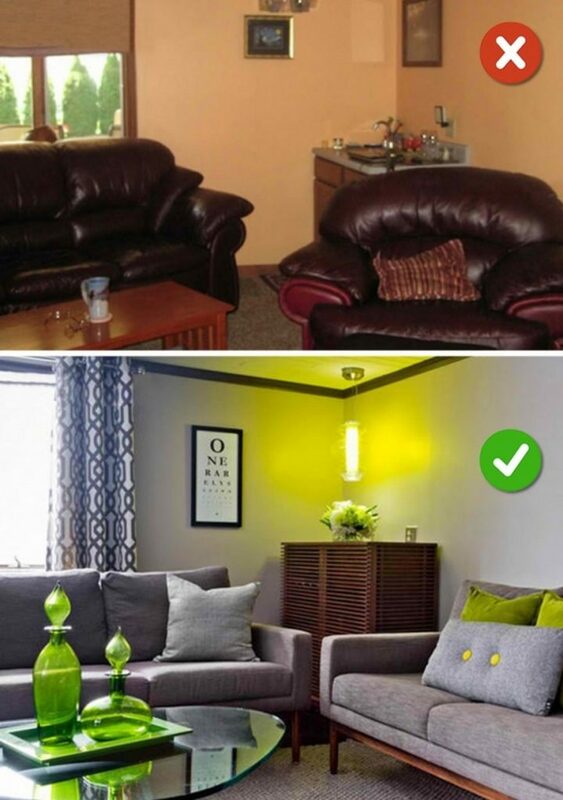 If you have a smaller room, placing the sofa against the wall is the best solution. But if you have a large living room, placing your furniture in the center of the room can make it appear cozy and comforting. It may not work for all rooms but it’s worth trying if you have a lot of square footage to play with. 13) You don’t have cushions or throw pillows. A sofa without cushions or pillows looks dull and uninviting. Adding cushions creates a relaxed and cozy sofa for you and your guests. 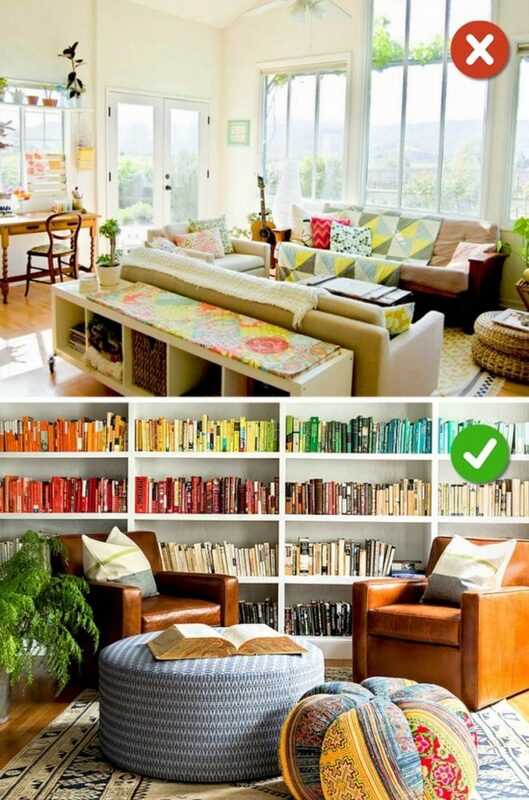 But, if your sofa came with matching cushions, throw them out! 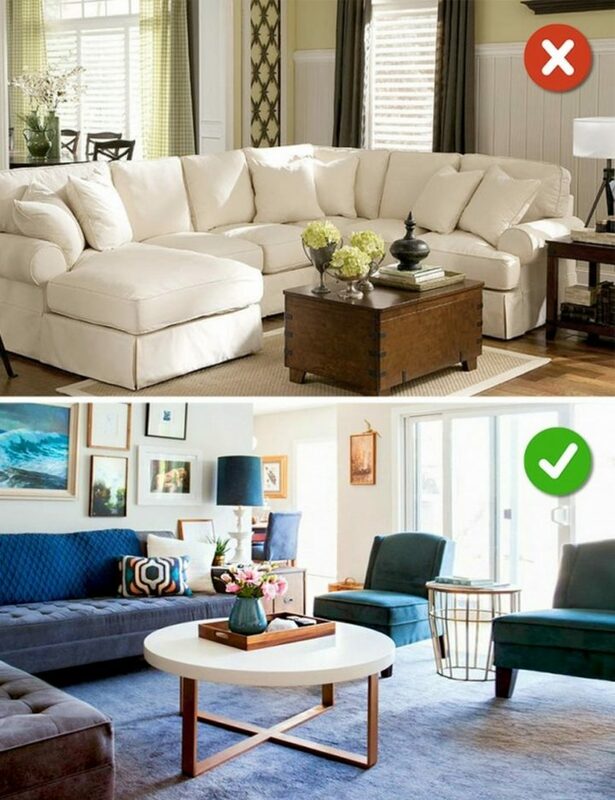 Instead, you’ll want to choose cushions that work with your sofa and don’t be afraid of bold colors or textures. There are also many sizes and shapes that work well with almost any sofa. 14) An incorrectly positioned TV. Because of glare, televisions should never be placed opposite a window. 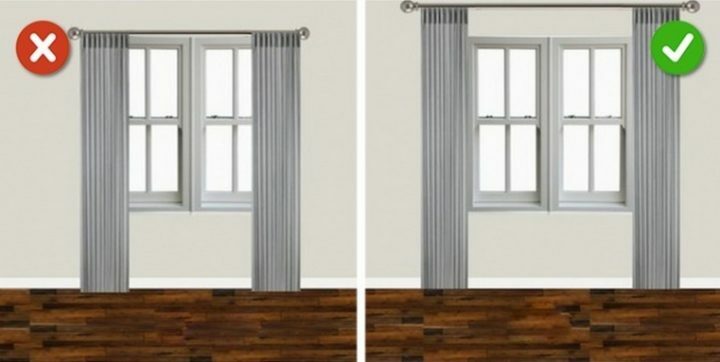 It should also not be placed on the same wall which has a window. The ideal position is on a blank wall with a window on either side. Because today’s televisions are incredibly detailed, you can generally place your sofa away from the screen 2-3 times its diagonal measurement. For example, if you have a 55-inch 1080p TV, you can sit as close as 110 inches away or 9 feet. With 4K TVs, you can even sit as close as 1-2 times its diagonal measurement because of their increased resolution. 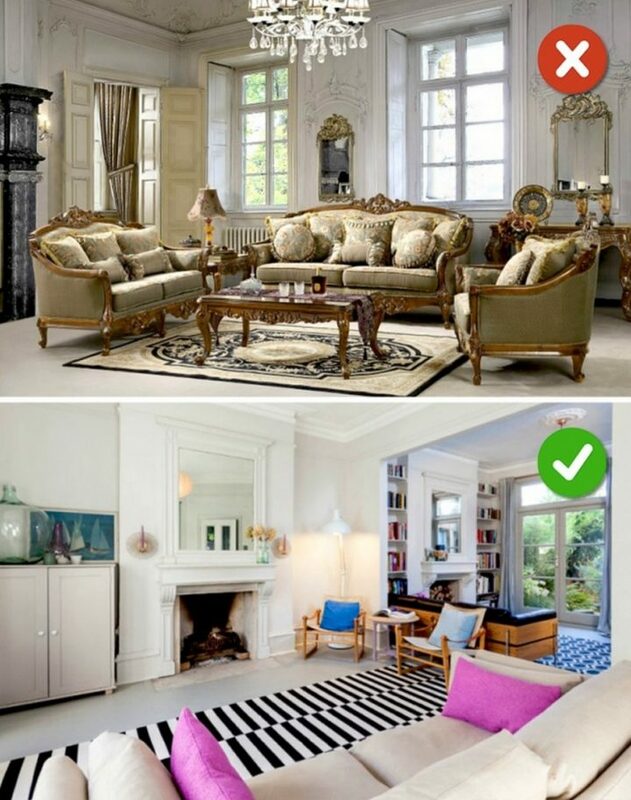 15) Lack of rugs or wrong size of rugs. If you have a hardwood or laminate floors, adding a rug in your living room can add warmth and coziness. Choosing a rug that is either too small or too large can bring imbalance in a room so make sure to choose the correct size for your living room. Generally, you want it large enough to accommodate the length of your sofa, coffee tables, and chairs. 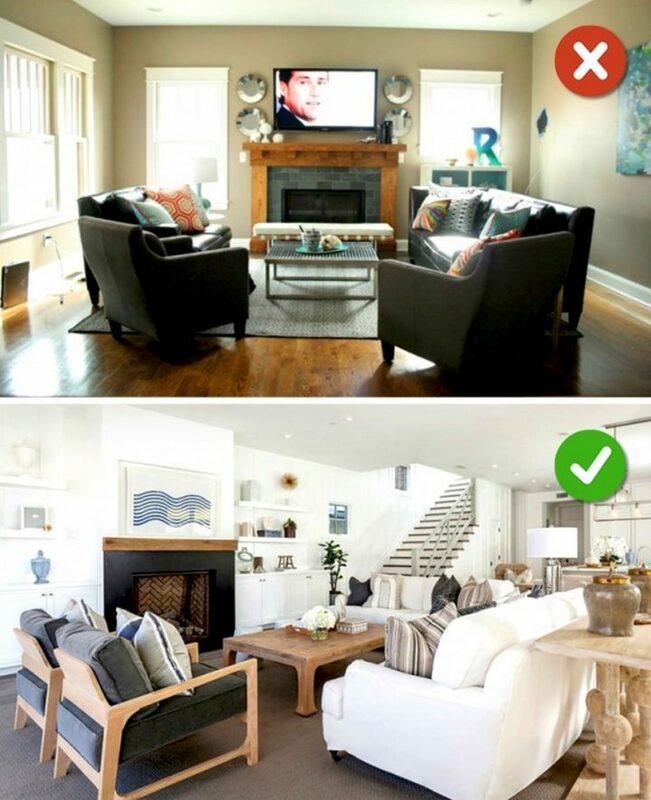 In addition to these home improvement ideas, you can transform your living room with these ideas and avoid living room design mistakes. Please share these15 living room design ideas with your friends and family.